Rachel Blum and Andy Landis are eight years old when they meet late one night in an ER waiting room. Born with a congenital heart defect, Rachel is a veteran of hospitals, and she's intrigued by the boy who shows up all alone with a broken arm. He tells her his name. She tells him a story. After Andy's taken back to the emergency room and Rachel's sent back to her bed, they think they'll never see each other again. Rachel, the beloved, popular, and protected daughter of two doting parents, grows up wanting for nothing in a fancy Florida suburb. Andy grows up poor in Philadelphia with a single mom and a rare talent that will let him become one of the best runners of his generation. Over the course of three decades, through high school and college, marriages and divorces, from the pinnacles of victory and the heartbreak of defeat, Andy and Rachel will find each other again and again, until they are finally given a chance to decide whether love can surmount difference and distance and if they've been running toward each other all along. 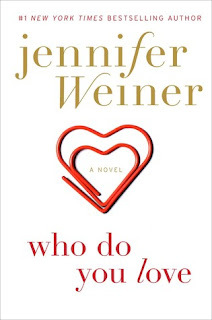 With honesty, wit, and clear-eyed observations about men and women, love and fate, and the truth about happy endings, Jennifer Weiner delivers two of her most memorable characters, and a love story you'll never forget. My thoughts: This is the first book I've read by Jennifer Weiner and I picked it up because it was one of the She Reads 'Books of Spring' selections. Don't get me wrong...it's not that I haven't heard of her, but her books just haven't spoken to me before, but I decided I would give this one a chance and I'm glad I did...I enjoyed it! What I really liked about this book is that we see the relationship between Rachel and Andi grow over time from their first meeting at the age of eight until they are full-fledged adults and we see that relationship go through a range of stages. It is heartfelt and full of emotion and shows the importance of knowing that sometimes love isn't enough. There needs to be more. Because the book spans thirty years, there is plenty of character development. It starts slowly giving us a full picture of just who Rachel and Andy are. We move on to the big stages in their lives, but then, the ending feels a bit rushed...why do that? Why take the time to set the stage and lay out the whole story and then rush the very part of the story that we are all waiting for? Overall, this was a good book and it does provide a little food for thought...who do you love? I will certainly be checking out Jennifer Weiner's other books - if you're a fan, what do you recommend I pick up next? Audio thoughts: This is the first time I've listened to either narrator and I thought both did a good job. Having a female and a male narrator was a great choice and made the story really come alive. 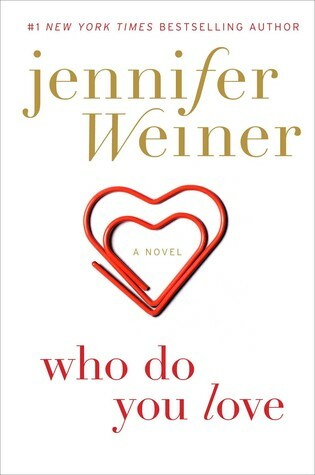 Who Do You Love by Jennifer Weiner is one of the She Reads "Books of Spring" reading selection picks. For fans of the quirky, heartfelt fiction of Nick Hornby and Eleanor Brown comes a smart, wry, and poignant novel about reconciliation between fathers and daughters, between spouses; the deep ties between sisters; and the kind of forgiveness that can change a person’s life in unexpected and extraordinary ways. The Rockwell women are nothing if not . . . Well, it’s complicated. When the sisters—Esme, Liv, and Ru—were young, their eccentric mother, Augusta, silenced all talk of their absent father with the wild story that he was an international spy, always away on top-secret missions. But the consequences of such an unconventional upbringing are neither small nor subtle: Esme is navigating a failing marriage while trying to keep her precocious fifteen-year-old daughter from live-tweeting every detail. Liv finds herself in between relationships and rehabs, and Ru has run away from enough people and problems to earn her frequent flier miles. So when a hurricane hits the family home on the Jersey Shore, the Rockwells reunite to assess the damage—only to discover that the storm has unearthed a long-buried box. In a candid moment, Augusta reveals a startling secret that will blow the sisters’ concept of family to smithereens—and send them on an adventure to reconnect with a lost past . . . and one another. My thoughts: This is one of the She Reads 'Books of Spring' selections and had it not been for that, I'm not quite sure I would have picked it up...but I'm so glad I did! It was delightfully quirky and sweet...endearing and odd, but overall, I ended up enjoying it, more so than I thought I would. And it totally reminded me of Eleanor Brown's The Weird Sisters for those of you that have read that one...another odd little book that I also found a bit quirky yet enjoyable! I loved this family...they were a mixed-up, drama-infused family that just begged to be heard and loved. Each was not without their own problems and flaws, but I think that only made them that much more endearing...sure at times they were a bit unlikeable and maybe you wanted to throttle them for the choices they made, but overall it was hard not to end up rooting for them to find happiness. This story is about love, family and forgiveness, but it's not an easy road to get there. The girls have grown up thinking that their father, never married to their mother, was a spy...little did they know that he wasn't what they thought. Trust has never been a big part of their world and suddenly when they need to lean on each other, they have to first learn how. This is the kind of story that makes you think about the relationships in your life...and differences aren't always a bad thing. They sometimes bring good to the table, balance things out. They sure balance this family out! I loved spending time with this quirky family and have a feeling I won't be forgetting them anytime soon! Audio thoughts: I just love listening to Cassandra Campbell narrate...she just such a great job with the voices and pacing. Her tone and emotions are spot on and she was well-suited for this book. 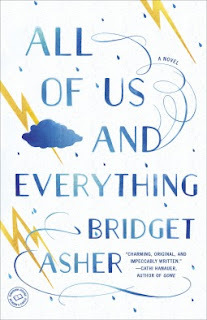 All of Us and Everything by Bridget Asher is one of the She Reads "Books of Spring" reading selection picks. The bestselling author of A Hundred Summers, brings the Roaring Twenties brilliantly to life in this enchanting and compulsively readable tale of intrigue, romance, and scandal in New York Society, brimming with lush atmosphere, striking characters, and irresistible charm. As the freedom of the Jazz Age transforms New York City, the iridescent Mrs. Theresa Marshall of Fifth Avenue and Southampton, Long Island, has done the unthinkable: she’s fallen in love with her young paramour, Captain Octavian Rofrano, a handsome aviator and hero of the Great War. An intense and deeply honorable man, Octavian is devoted to the beautiful socialite of a certain age and wants to marry her. While times are changing and she does adore the Boy, divorce for a woman of Theresa’s wealth and social standing is out of the question, and there is no need; she has an understanding with Sylvo, her generous and well-respected philanderer husband. But their relationship subtly shifts when her bachelor brother, Ox, decides to tie the knot with the sweet younger daughter of a newly wealthy inventor. Engaging a longstanding family tradition, Theresa enlists the Boy to act as her brother’s cavalier, presenting the family’s diamond rose ring to Ox’s intended, Miss Sophie Fortescue—and to check into the background of the little-known Fortescue family. When Octavian meets Sophie, he falls under the spell of the pretty ingénue, even as he uncovers a shocking family secret. As the love triangle of Theresa, Octavian, and Sophie progresses, it transforms into a saga of divided loyalties, dangerous revelations, and surprising twists that will lead to a shocking transgression . . . and eventually force Theresa to make a bittersweet choice. Full of the glamour, wit and delicious twists that are the hallmarks of Beatriz Williams’ fiction and alternating between Sophie’s spirited voice and Theresa’s vibrant timbre, A Certain Age is a beguiling reinterpretation of Richard Strauss’s comic opera Der Rosenkavalier, set against the sweeping decadence of Gatsby’s New York. My thoughts: It's so big secret that I am a huge Beatriz Williams' fan! I have devoured her previous works and of course did the same with this latest one. And with it being set in the Jazz Age in New York City...I was in heaven! I just loved the setting and the characters...oh my - a pure reading delight! 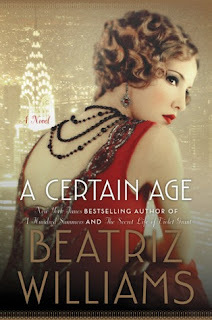 Does anyone create such delicious characters and scandal as Beatriz Williams? I'm not quite sure, but I know when I pick up one of her books, I am going to be entertained and delighted with scandal, intrigue and the most wonderful, memorable characters that I have encountered in a long time. And that's exactly what we get in A Certain Age...and there are some familiar faces if you've read her previous books - not that that's a requirement, just a bonus! Oh, and if you've read the recent anthology that Beatriz Williams contributed a story to, Fall of Poppies, you will recognize young Octavian Rofrano...again, not a requirement, but bonus if you've read it. I loved both Sophie and Theresa's characters...they are such richly developed characters, yet not without their flaws. Both just come alive on the pages and you can't help but sympathize with each at some point throughout the book. I found myself going back and forth between who I was more drawn to because when I liked one, I found I tended to dislike the other. The character development of these two is strong and I so wish that this book didn't come to an end because I didn't want to part with these characters. The events of this book are actually based on an opera and while I'm not familiar with the opera at all, I found it did not detract from my enjoyment at all. The romance was set to the 1920's and then there's the added dimension of the murder, dubbed the "trial of the century." I loved the news articles that appeared throughout the book giving updates on said trial - it helped moved things along. And perhaps another layer that had nothing to do with the storyline itself, but added a nice charm and extra touch, were the little snippets of advice from Helen Rowland...I loved these! They had just the right amount of wit to match the characters and story but didn't detract from the story line itself. I've read all but one of Beatriz Williams' books and I have to say, this one might be my new favorite, though they all have a special place in my heart. I had the pleasure of seeing her last night at one of her book tour stops and had a chance to chat with her - she's got some great books coming up and I cannot wait til they come out, though it will be a while! Guess that means I have time to read that one book I haven't read yet! On the eleventh hour of the eleventh day of the eleventh month . . .
November 11, 1918. After four long, dark years of fighting, the Great War ends at last, and the world is forever changed. For soldiers, loved ones, and survivors, the years ahead stretch with new promise, even as their hearts are marked by all those who have been lost. As families come back together, lovers reunite, and strangers take solace in each other, everyone has a story to tell. 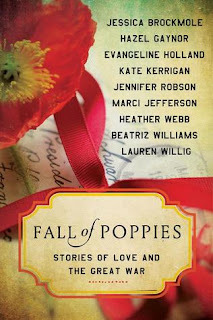 In this moving, unforgettable collection, nine top historical fiction authors share stories of love, strength, and renewal as hope takes root in a fall of poppies. My thoughts: I don't tend to read too many anthologies, but when I saw who was contributing to this one I thought I would give it a try. 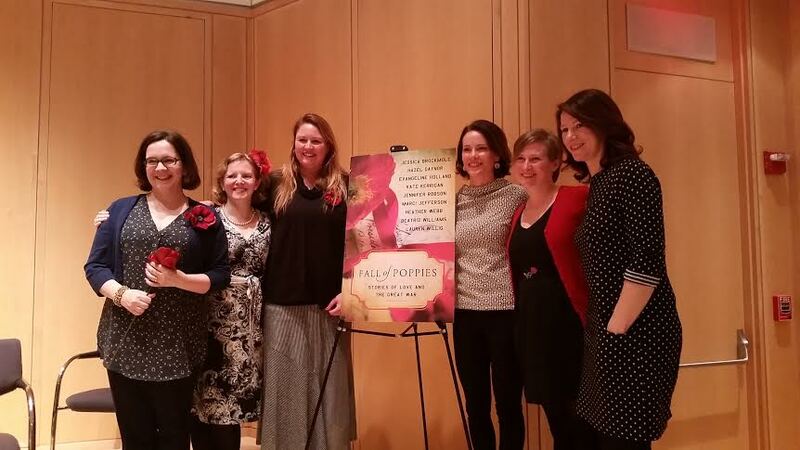 I was fortunate enough to be able to see six of the nine women on launch day discuss the book and I became even more intrigued. 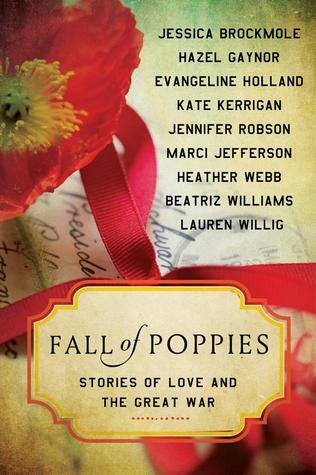 What makes this anthology so interesting is that Heather Webb, who spear-headed this project, came up with the idea of having the authors all write about this one topic - that being Armistice Day, the 11th hour of the 11th day of the 11th month. What's absolutely amazing is just how different and how captivating each of the stories are. As short as they are, it's so easy to get wrapped up in them and want them to continue because you get caught up in the little worlds that these authors have created. I have to say that despite the heavy topic, I really loved each and every one of them...they look at the emotional and physical effects of the war, and at times left you feeling emotionally drained, but they were good stories. And, I felt I learned a little bit (death masks? never heard of those before!) - again, one of the things I love about reading historical fiction. Of the nine authors, I had only read three before this. I had heard of two others and the rest were all new to me...and now, I will definitely be going back and reading all of their works. These short stories were great morsels of introductions for me and I can't wait to pick up full-length novels and get more acquainted with them. In this dazzling new novel, Emily Giffin, the #1 New York Times bestselling author of Something Borrowed, Where We Belong, and The One & Only introduces a pair of sisters who find themselves at a crossroads. Growing up, Josie and Meredith Garland shared a loving, if sometimes contentious relationship. Josie was impulsive, spirited, and outgoing; Meredith hardworking, thoughtful, and reserved. When tragedy strikes their family, their different responses to the event splinter their delicate bond. Fifteen years later, Josie and Meredith are in their late thirties, following very different paths. Josie, a first grade teacher, is single—and this close to swearing off dating for good. What she wants more than the right guy, however, is to become a mother—a feeling that is heightened when her ex-boyfriend’s daughter ends up in her class. Determined to have the future she’s always wanted, Josie decides to take matters into her own hands. On the outside, Meredith is the model daughter with the perfect life. A successful attorney, she’s married to a wonderful man, and together they’re raising a beautiful four-year-old daughter. Yet lately, Meredith feels dissatisfied and restless, secretly wondering if she chose the life that was expected of her rather than the one she truly desired. As the anniversary of their tragedy looms and painful secrets from the past begin to surface, Josie and Meredith must not only confront the issues that divide them, but also come to terms with their own choices. In their journey toward understanding and forgiveness, both sisters discover they need each other more than they knew . . . and that in the recipe for true happiness, love always comes first. Emotionally honest and utterly enthralling, First Comes Love is a story about family, friendship, and the courage to follow your own heart—wherever that may lead. 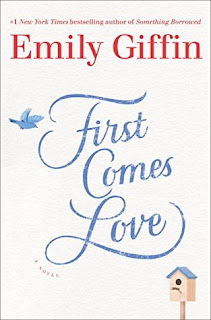 My thoughts: It's been a while since I've read anything by Emily Giffin, so I was quite pleased to get my hands on her latest book and thrilled to see that it was one of BookSparks #SummerReadingChallenge selections this summer! I loved her Darcy and Rachel books from years ago and even though this is a stand-alone, I was quite eager to dive right in! Right from the opening pages, I found myself completely hooked and captivated with this story. It's equal parts emotional and humorous and I found that to make it that much more endearing. The characters are all so richly drawn and whether you end up loving them or not, siding with them or wanting to throttle them for their at times selfish choices, they come alive on the pages and you just want them to find peace - whatever that peace might look like for them. Having two sisters, I felt that at times, I could completely empathize with each of the sisters for how they were feeling towards the other sister - the relationship dynamic that Emily Giffin writes is so spot on. This wasn't always an easy read - it takes a hard look at family dynamics and how tragedy affects everyone in a different way, but it's a good read, and it's heartwarming and honest. I really enjoyed this book and cannot wait to see what Emily Giffin writes next. In the meantime, I think I need to go back and see what books of hers I missed. What's your favorite Emily Giffin book? I think this one might be mine! 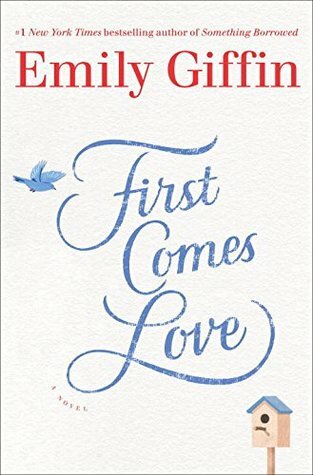 First Comes Love by Emily Giffin is one of BookSparks "Summer Reads" reading selection picks.